Ian Hook, Sydney, 08/08. 15cm high. From Timothy Tse, Sydney, from Marjory McNamara originally? 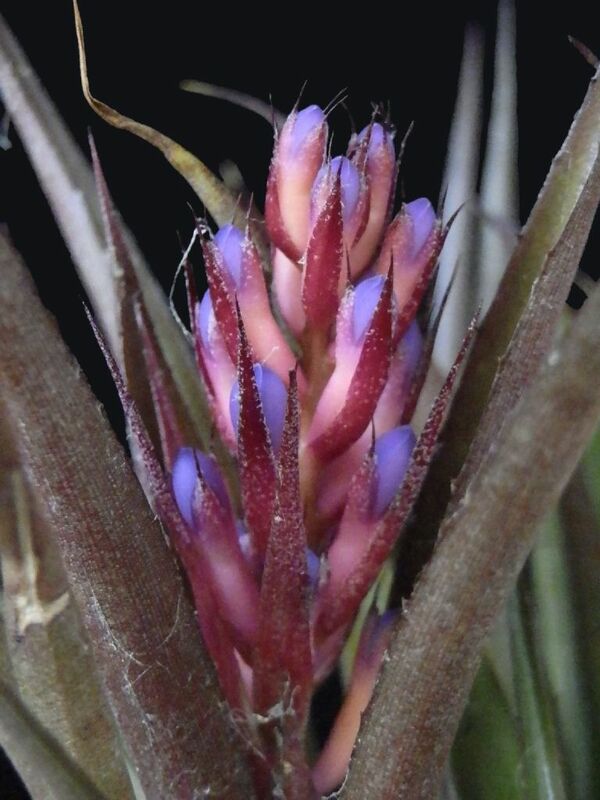 Aechmea seideliana - an identity problem. Revisited in 2006. If you are a person who believes we should follow the formal description of a species and be a Doubting Thomas regarding the claims of a nurseryman read on! 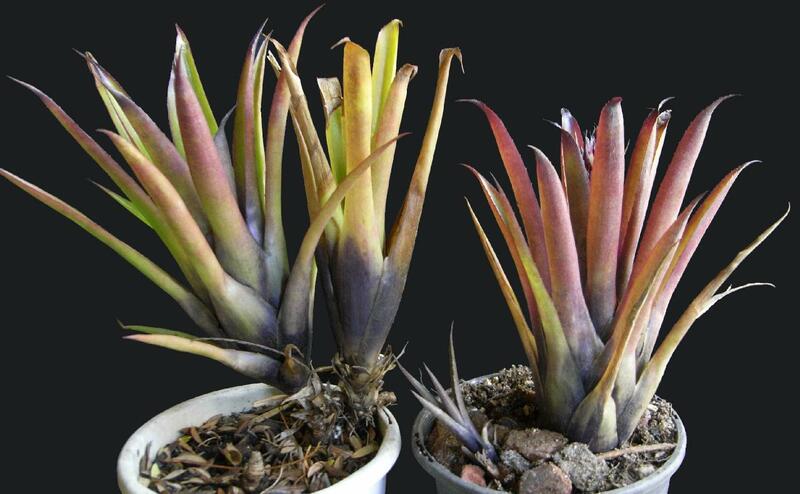 Note this species must not be confused with Aechmea roberto-seidelii or even Aechmea seidelii !! 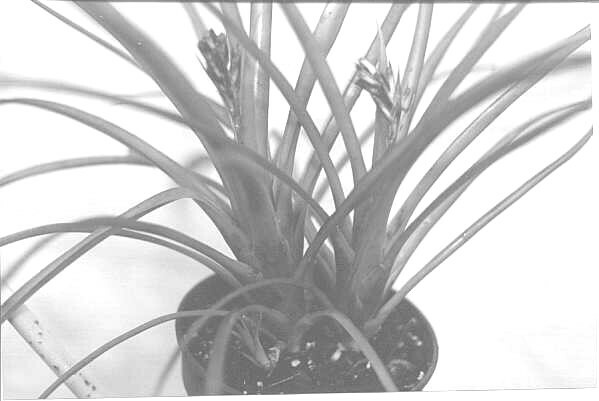 If you look under the article on Aechmea roberto-seidelii you will see that Alvim Seidel in 1990 considered his plant under this name looked like A. racinae and not like A. pineliana as it should. We now enter the realms of the Aechmea subgenus Ortgiesia where hybridizing occurs very easily in cultivation without man’s intervention. One wonders if this happens just as easily in the wild! I had thought this problem of identity was just in Australia beginning in the 1980’s but we have just received from Reginaldo Baiao of Rio de Janeiro, Brazil, photographs which show stronger links to A. pimento-velosoi than A. seideliana as described by Weber. Investigation has revealed that Reginaldo bought his plant recently from Seidel. If you compare this with the differential diagnosis with A. pimenti-velosoi by Weber (see below) you find that Reginaldo’s plant has wide leaves not narrow and sepals not high connate, making it much closer to A. pimenti-velosoi. In addition the petals are yellow not white as stated by Weber. Reginaldo tells me that if his plant is grown in shade it does get narrow leaves and this could well have been the case when Weber was growing his specimen to flowering condition in East Germany in the 1980’s. It does seem that we are no further forward in trying to find a true living example of this species. It seems to be a case of nearly but. First we should look at the original description duly translated to English, that follows and Weber’s original drawing to give you an idea of what we are worrying about! 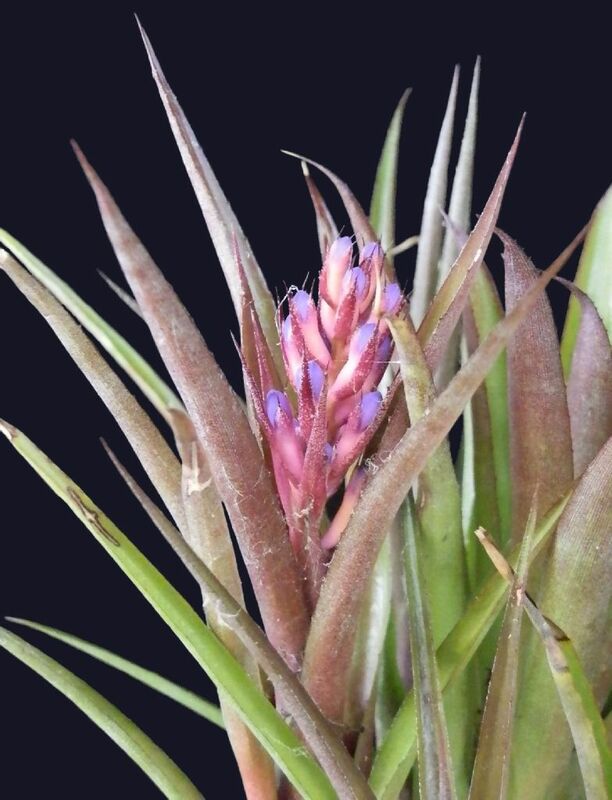 Similar to Aechmea pimenti-velosoi Reitz 1952, but leaves narrower, sepals with a longer mucron and high connate. Scape bracts erect, longer than the internodes, the bottom ones leaflike, the upper ones triangular-lanceolate and whitish, the edges of the blade with fine spines. Flower bracts triangular-lanceolate, long awl-like, carmine red, membranaceous, to 38mm long, 9mm wide, with white scattered scales, edges with very fine spines, longer than the sepals. Sepals 14mm long, including a 5mm long mucron, carmine red, joined for 5mm, nerved, not scaled, with weakly asymmetrical membranaceous edges. Ovary weakly three cornered, egg shaped, 11mm high, 5mm diam., whitish carmine red, Epigynal tube very striking. Let us now look at what has been written in the past. It must have been 3 years ago that I recognised problems with Aechmea roberto-seidelii and Aechmea seideliana and its two varieties rubrafolia and purpurea. It was a challenge I could not resist because I felt that hybrids must be involved somewhere. Those who went to the Sydney Conference would have heard of further updates to the saga but little about conclusions. 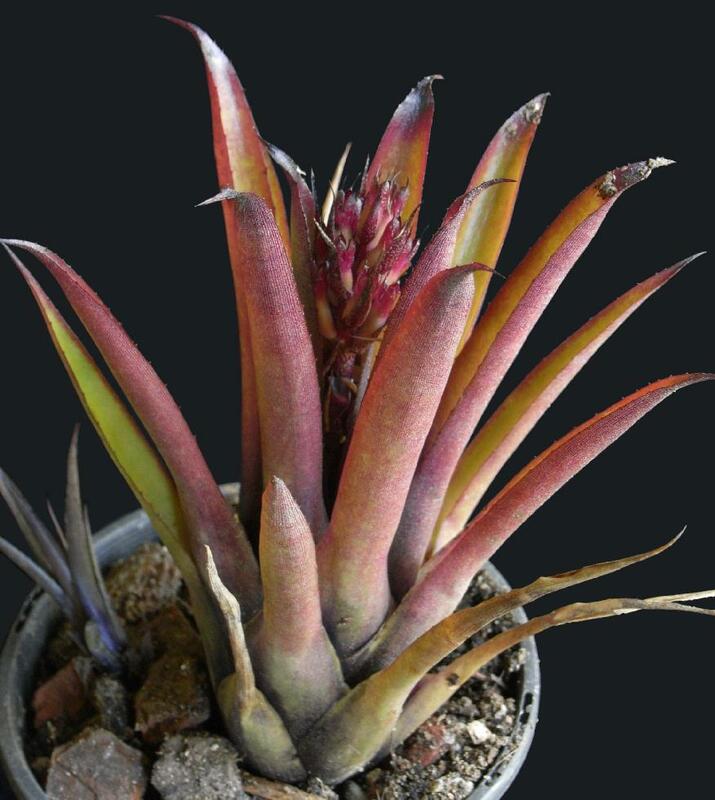 I have now decided that the hybrid problems must revolve around Aechmea roberto-seidelii and that any plant with pendant Aechnea warasii flowers on a plant called Aechmea seideliana should have its label stomped on ! I have a strong feeling that Aechmea seideliana is in Australia and is floating around the eastern states under the guise of Guzmea --?--or Aechmea recurvata hybrid. Needless to say, when at the Sydney Conference and seeing Guzmea --?-- on a label was just too much temptation to place upon a fellow such as myself. Now, three months later I have a flower which brought me to think of the Ortgiesia group of Aechmea. With the help of Luther's List (or is it Franklin's Tape) I came across this Aechmea seideliana. I was able to acquire a photocopy of the original description by W. Weber in Feddes Repertoriium 1986 and the drawing as shown here should be of great interest. The description tallies almost exactly, and I do suggest that if we can find how this plant did get to Australia, sufficient material be sent to Harry Luther for official investigation. The only thing that grates is the blue petal blades compared to whitish in the description. However, this is not as bad as it sounds when you realise that Tillandsia lorentziana description says white petals whereas there is a blue flowered form, and our own Marjory McNamara brought back white flowered Tillandsia reichenbachii despite the official blue/violet! Weber related this plant to Aechmea pimenti-velosoi, but with much narrower leaves. Whether the true Aechmea pimenti-velosoi is in Australia is another challenge. To confuse matters there is a variegated plant called Aechmea pimenti-velosoi in the eastern states which clearly is NOT and is being closely monitored ( Now ‘Pie in the Sky’). 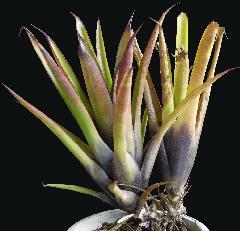 Secondly, many of the Aechmea recurvata hybrids resemble a true Aechmea pimenti-velosoi. The provisional name of Aechmea recurvata hybrid given to this plant is intriguing in that it is an easy way out. If it is an F1 hybrid then we should be growing self-set seed to prove it. Secondly we must use Bill Morris's philosophy and ask ourselves who was Father. The thin leaves give us a problem and the use of Guzmea --?-- would undoubtedly have been an attempt in trying to solve the problem. I understand that the plant was grown from seed by Lou Forrest but where did he obtain the seed? I also understand that the Australian Society imported seed from Seidel a few years ago although I have no documented proof. We in South Australia are currently discussing an "odd" plant we obtained from Ruby Ryde also raised from seed and possibly the same vintage. 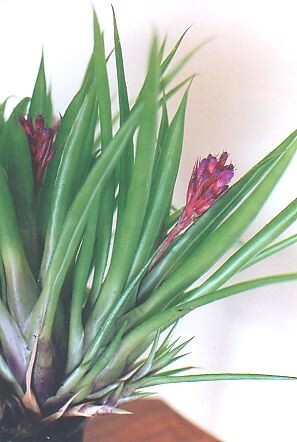 This particular plant has definite links to Aechmea pimento-velosoi and has been referred to Elton Leme for comment. (Now ‘Aussie Ruby’) We will report on progress as details come to hand. In the meantime,if you are aware of any extra details you may have on the Aechmea seideliana please contact the writer. I have to take responsibility for starting Derek Butcher off on the trail of Aechmea seideliana. His interest in this plant came about when he and Margaret visited my home after the Sydney Conference last year, and in looking at my collection, Derek seized upon a plant that I had labelled as --- "Aechmea ? (originally labelled Guzmea)". Neither of us believed for a moment that the plant was a Guzmea (a bigeneric cross between Aechmea and Guzmania) but it was interesting to speculate as to what the plant might actually be - so a piece found its way to South Australia. 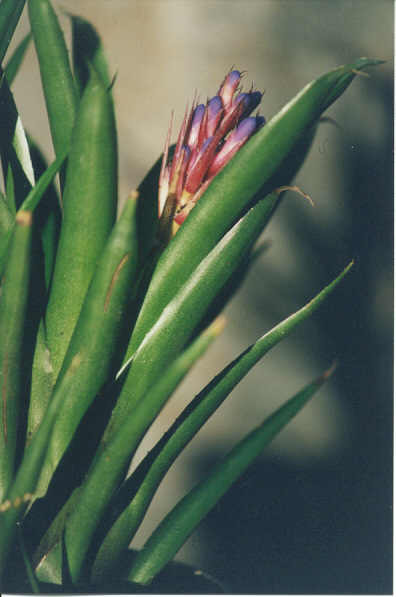 The plant soon flowered for Derek and the result of his research was that the plant was very close to Aechmea seideliana described fairly recently by Weber. Derek's article was in the Nov/Dec 1991 Bromeletter. 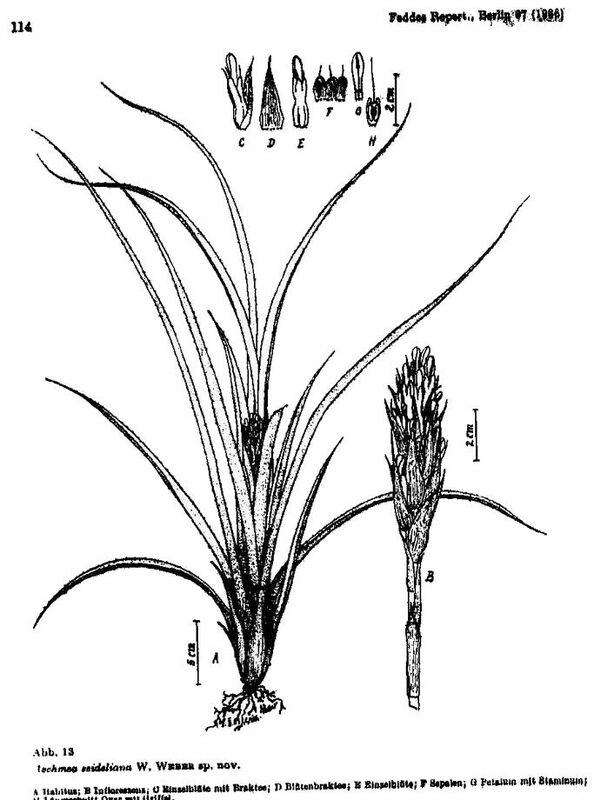 I had tried several times to key out the plant using Smith and Downs but I was never able to achieve a satisfactory result so I concluded that the plant was either a species not described in Smith and Downs or was a hybrid with an Ortgiesia parentage. I was very pleased, then, when Derek came up with the A. seideliana name - one that is not listed in Smith and Downs. I originally purchased the plant from Lou Forrest in Oct 1987 and it was one of my first purchases. 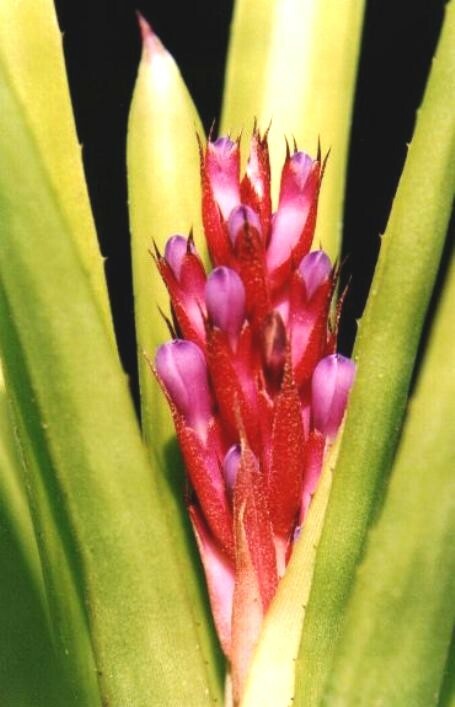 He said that a woman in Sydney had crossed an Aechmea with a Guzmania to produce this plant and so he sold it to me as a Guzmea - but he was quite sceptical that it was anything other than an Aechmea. I didn't know any better at the time so I went along with what he said. In the last day or so, the story has had a new player added to the cast. Now a plant labelled as Nidularium microps var bicense is involved. This plant seems to have been imported from New Zealand at some time (or so the label indicates) and has passed through several hands before arriving at Bill Morris'. Bill was attracted to the plant because it seemed different to his other Nid. microps plants. And it was different! 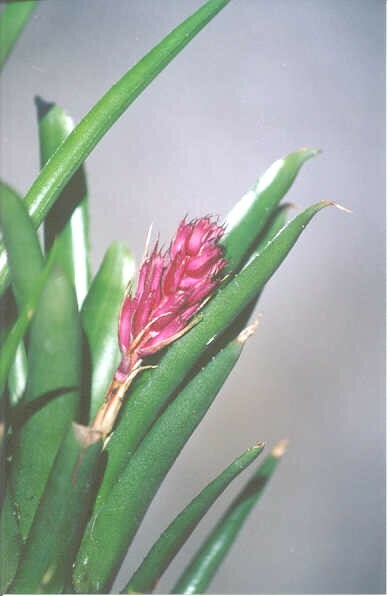 The plant flowered for Bill and it was obvious to him that it was not a Nidularium at all, but same sort of Aechmea from the Ortgiesia group. On inspection, this plant has red leaves but otherwise would appear to be the same plant as my "Guzmea", at least in vegetative form (without the benefit of a flower on either). 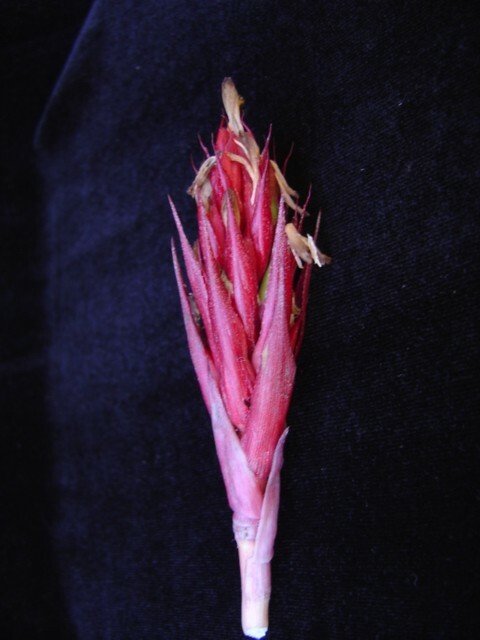 This red Nidularium could easily turn out to be another form of Aechmea seideliana. I am told that there are other plants with wider Leaves labelled as Aechmea seideliana in a few collections in Australia and at least one of these has been identified by Elton Leme as Ae. seideliana. To cloud the issue even further, there is yet another candidate. I have a half sized version of the "Guzmea" with the same flowers as the larger one but only half as many of them and with the leaves half the length and half the width. This small one is grown side by side with the larger, so I doubt whether the difference can be attributed to environmental conditions alone. ..... That makes at least 4 potential Ae. seideliana’s. What remains to be done now to solve this dilemma is to grow the "Guzmea" large, the "Guzmea" small, the "Nidularium", the selfed seedlings and the already identified Ae. seideliana in similar conditions, to compare the inflorescences and to eventually have Harry Luther pass comment on them. 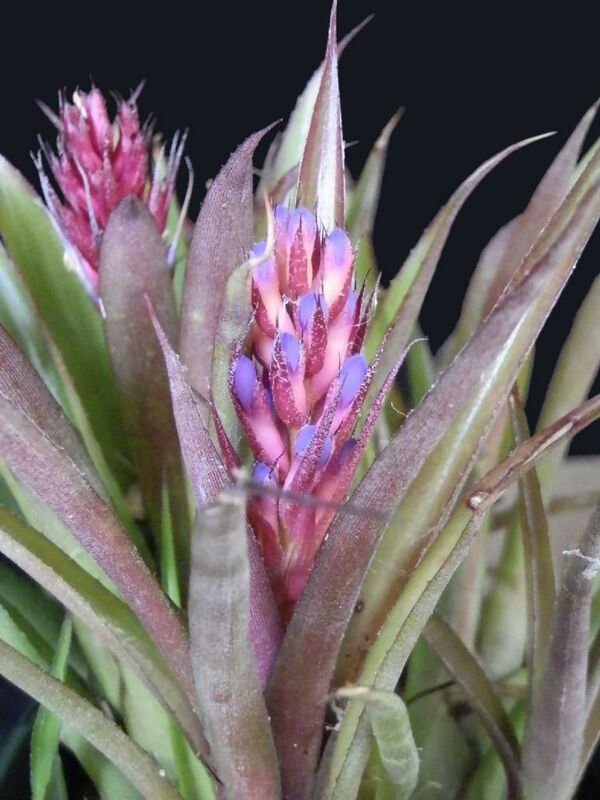 Hopefully this will put to rest another "identity problem" in bromeliad naming in Australia and perhaps New Zealand.